Make lists and get organized. 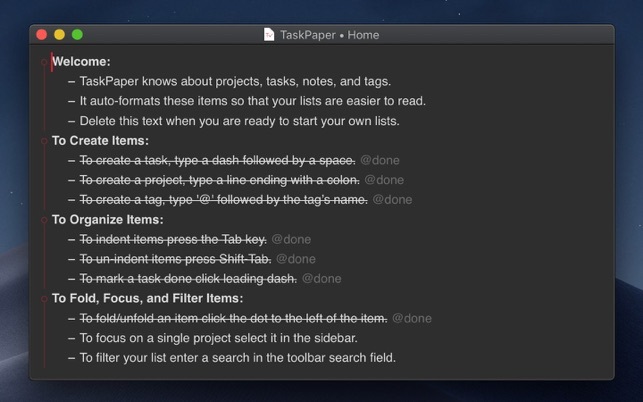 TaskPaper is a plain text to-do list that’s surprisingly adept. Thoroughly modernized. 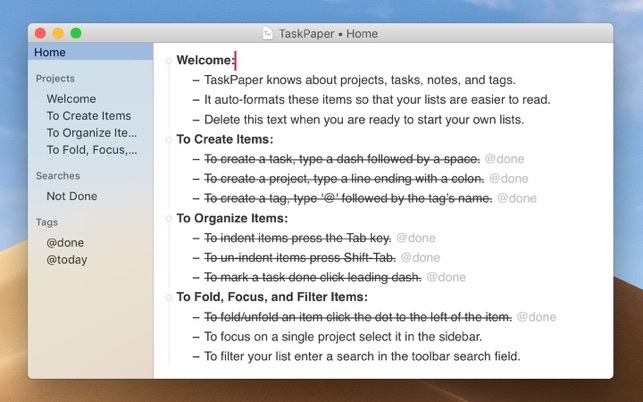 TaskPaper 3 is all new, while still retaining the same plain text design that’s been getting things done since 2006. Buy now to make lists and get organized! 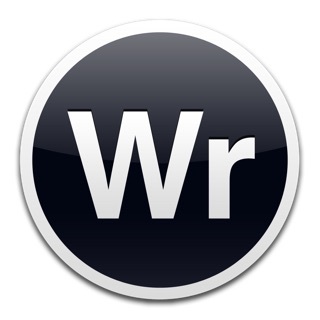 So hard to encapsulate what a joy it is to use this app. It is fast. It is easy to learn. It is reliable. 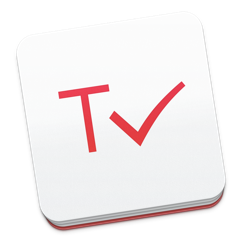 With fast search and tag filters, I am able to track dozens of projects and tasks and notes with ease. My list does not become overwhelming because I can quickly and intuitively filter it to zoom in on a set of tasks by context, by due date, etc. What really stands out for me is the way it adapts to the way I generally think about tasks and projects — it is usually a non-linear process where thinking about one task or project triggers a memory about another thing to do. 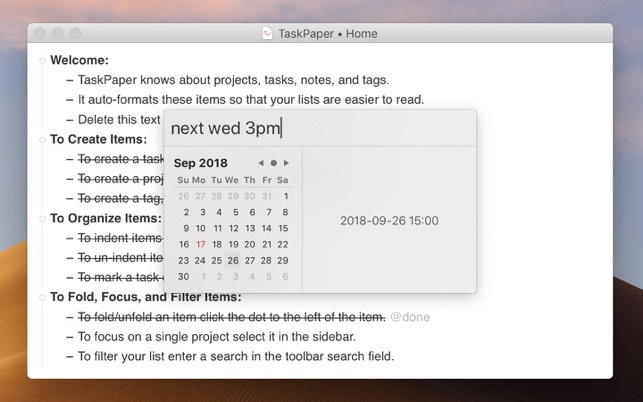 From anywhere in the app I can immediately start adding a new project or task. I don’t need to click-click-click to get to a Project view or Inbox view and then proceed from there. It is that ease of capturing projects and tasks that gives me a sense of calm and “ninja-ness” in managing what I need to do. Longtime user recently bought back in with v3. I wish I could set the app to open with the last active project(s). I’m using the same project most of the time so it’s a hassle to have to open it after launching the app. In-app theme eiting would be awesome (select text, change size and color, etc). Hi. 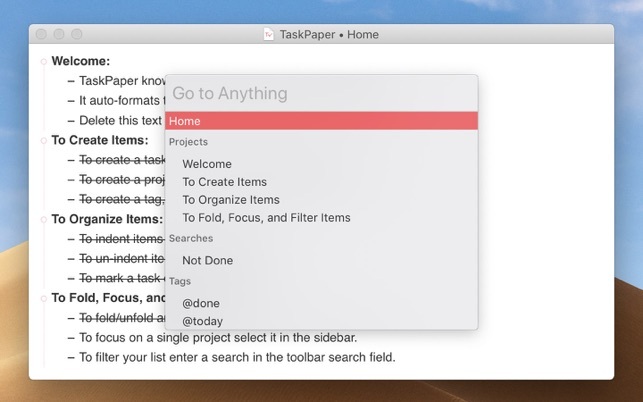 TaskPaper is able to open with the same projects that were open when you last quit. 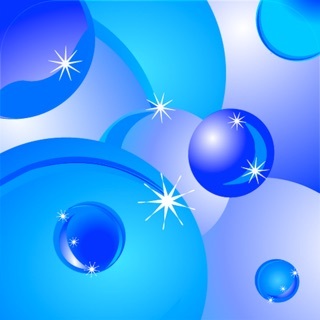 For more details please go to TaskPaper's support site (support.hogbaysoftware.com) and search for "How do I make TaskPaper restore open documents when it starts". What an elegant, mature app! Its wonderful design, polished down to the very small details, hides tremendous complexity. All of this care and thoughtfulness results in a flexible, powerful application that lets you build your own system for tracking ideas and breaking them down into actionable tasks. I spent years using a text editor to create my own ad hoc (off-the-cuff) plain-text to-do system, but it slowly grew out of hand. The collapsible navigation pane and projects feature of TaskPaper allowed me to tame and reorganize my unruly, overgrown text file and put a lot more structure back into my work. Now I can see where I am and where I am going. And I can jump around and drill down on small parts of the overall project a lot more easily, working non-linearly, without worrying that I will forget any details. And the whole time, I have a non-proprietary text file that can be synced with Dropbox and can easily be manipulated and processed with many community-provided tools. 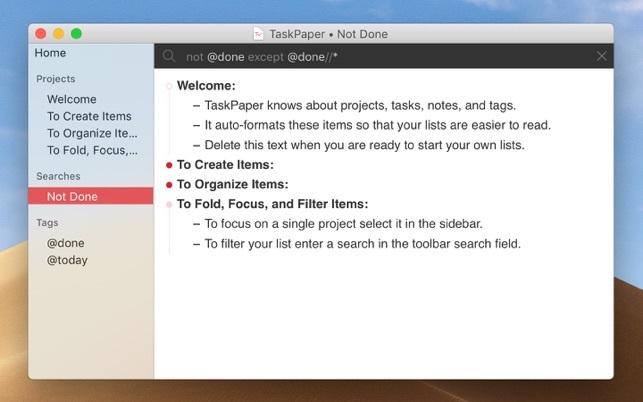 TaskPaper sets a high bar for software quality and design on all fronts. Kudos Jesse.